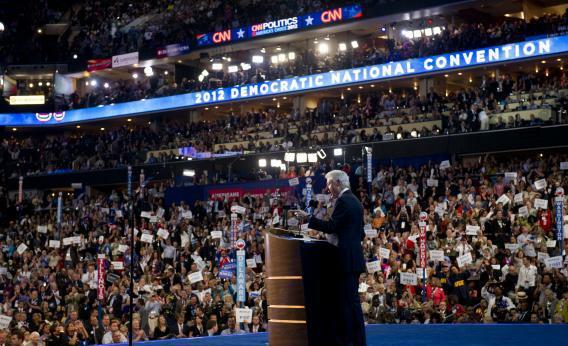 Bill Clinton's DNC speech: How do we judge if it was any good? Was Clinton’s Speech Any Good? How To Know? The crowd loves it. Draw from that what you will. Every convention I’ve been to—political, academic, “issue”-oriented—has been a degrading spectacle in which all the participants are chiefly employed in insisting upon the importance of the proceedings. National political conventions, while less melancholic than their academic counterparts, are rendered more disturbing by the strength of the conviction that something truly important is about to happen. The closest we’ve come to anything happening in the past two weeks has been an empty chair and a few glorious trick teleprompterless moments by Bill Clinton, moments in which he was riding the crowd, reacting to their reactions, riffing in such a way that it was possible to believe he would go off-script in spirit rather than merely in fact. He didn’t, of course—that’s why it’s a trick, and that’s why he was deemed an acceptable speech-giver by the Democratic establishment—but it’s a good trick that seemed especially welcome after the worst string of speeches we’ve endured in five days of them. If pressed to give a justification for the national political conventions, I’d tell you that Joan Didion would never have written “Insider Baseball” had she not been assigned to cover them, and several perfect sentences inside a near-perfect essay are plenty justification for any event short of human sacrifice. In this essay and elsewhere Didion would report what she saw—a stiff game of catch between Michael Dukakis and his advisers staged for the journalists—and juxtapose her own notes with the earnest reports of candidate-loving reporters. (“He rolled up his sleeves but never loosened his tie,” wrote a rapt Michael Kramer.) The whole game unravels in a few devastating sentences. What I thought I was seeing clearly, through my own eyes—a wandering, vaporous, contrived display of middle-brow sentimentality and word-goo—I entirely misinterpreted, apparently. Or everyone else misinterpreted it, perhaps, which comes to the same thing. To disagree with the conventional wisdom even as it’s being born around you—and even as you’re trying with all your might to anticipate and even shape it—is a profoundly disorienting experience. It makes you wonder if you were there at all, or if there even exists a there to be at. Kirn is seeing something that has less to do with the person onstage and more to do with a collective judicial process. The means of determining whether a speech was a good speech have become more mysterious. Do you trust yourself? I thought Paul Ryan’s speech was atrociously delivered, but Twitter persuaded me I was wrong, that I was hostage to some quirk of my particular psychology. But why I should believe my demographically limited Twitter feed is unclear, as is why I should believe a random Texas neighbor of mine (and won’t he change his mind, anyway, when the people on my Twitter feed go on network television and tell him it was good?). It’s enough to make you long for an alternative world in which we skip the speeches altogether, let the journalists caucus, and agree to believe whatever story they tell. But then, as I said, we wouldn’t have “Insider Baseball,” or Walter Kirn’s lovely dispatch, which you should absolutely read.